The chestnut is a nut that makes its way to your local farmer's market during the late fall and early winter months. The chestnut tree belongs to the same family as the oak and beech trees. Chestnuts have been a staple in southern Europe, Turkey and Asia for many centuries and are now grown in the United States. Chestnuts have to be cooked before they can be eaten. Their sweet, golden meat can be savoured on their own, as a snack, or incorporated in sweet or savory dishes. They are rich in vitamins B1, B2 and C, minerals (such as, potassium, magnesium, calcium, sulphur and phosphorus) and fibers. They have a very high content of folic acid, which is known to prevent birth defects during fetal development. Chestnuts are also rich in complex carbohydrates that make them an important source of energy for athletes and active individuals. This is also an ideal food for those suffering from chronic fatigue and nervous exhaustion. The chestnut starch is slowly absorbed, stabilizes blood glucose levels and prevents the accumulation of fat in the body. The nut is gluten-free and is an ideal snack for people with celiac disease or gluten allergies and sensitivities. Because of the high percentage of carbohydrates, chestnuts are also relatively high in calories. 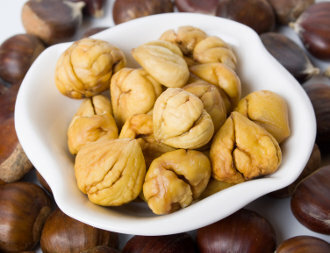 For example, 100 grams of European chestnuts, boiled and steamed provide 131 calories, roasted in the oven provide 245 calories and in the form of chestnut flour provide 323 calories. Among all the nuts, chestnuts are the lowest in fat , with approximately 2 grams of fat per100 gram serving. In most countries, the chestnut trees are not subject to chemical fertilizer or pesticide treatments. When buying chestnuts, make sure they are free of any signs of mold. The skin should appear smooth and bright in colour. Select the ones that are firm and heavy for their size. Use the thumb and forefinger to pinch each one and ensure that the nut is hard against the shell. Before cooking, chestnuts should be soaked in water for a couple of hours and you should remove those that rise to the surface, as they may be old. There are many ways to cook chestnuts. Here are some quick and simple methods that you can use to prepare and introduce them into your diet. 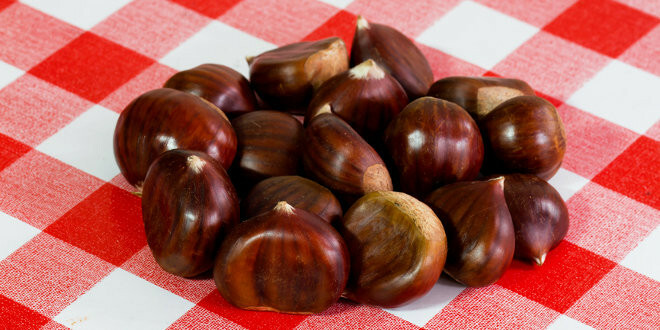 To boil, place chestnuts with their skin into a pot of boiling water and simmer for 15 to 25 minutes. Drain well and peel carefully. At this point, you can eat them right away or use to make chestnut puree. To roast chestnuts, you will need to prepare each one before you put them in the oven. Make horizontal cuts on each side of the nut, because they can potentially explode from internal pressure if the skin is not pierced. Place on a baking sheet in a 400F (200 C) oven for 25 minutes. Then, remove from the oven and place a damp cloth to cover them. This step will create steam, which will cook the chestnuts more evenly and make it easier to remove the skin. Return the chestnuts to the oven for an additional 5 minutes. Remove the baking sheet from the oven, peel the roasted chestnuts and serve hot. Next Kamut Or Khorasan Grain?